I came across a DIY post on Tumblr that showed how you can freeze watercolor paints in ice cube trays and then use the frozen paints to "draw" on fabric or paper. I instantly thought I could do that with Kool Aid and yarn! I just had to wait for my Oregon "summer" to cooperate. I needed it to get sunny and warm enough to melt the ice cubes. NOTE: This technique will NOT work on cotton. Kool Aid and food coloring will only dye wool, silk or other animal fiber/hair. Remember to wear your gloves! 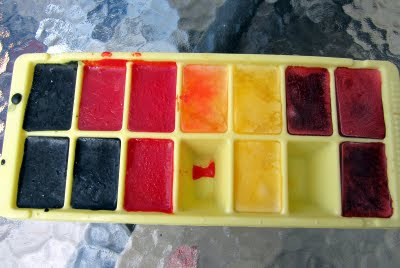 I took one packet of Kool Aid and mixed it with just enough water to fill 3 ice cube sections (do not add sugar! Just KA and water.) Then I froze them. Klass is a Mexican version of Kool Aid that I picked up at a Latino grocery store. I soaked my WOOL yarn in warm water and vinegar for about a half an hour. I gently squeezed out the water and then laid it into a glass 9x13 baking pan. I put the frozen dye cubes on top and set it outside in direct sunlight. 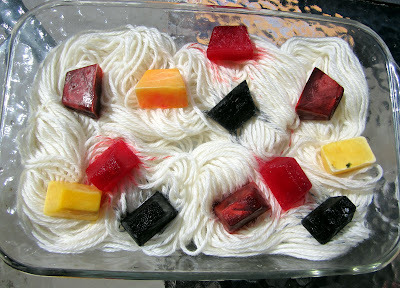 When I first put the dye cubes on the yarn. After an hour in the sun. Once it was completely melted- in my case about an hour and a half- I covered it with saran wrap to help raise the heat and incubate the yarn. In hindsight, I could have just covered it when I first put it outside to melt. You need the yarn to reach about 180 degrees Fahrenheit (really, you just need it to be HOT!) to set the dye in the yarn. You could also cook the yarn in your oven or microwave it for a few minutes but I wanted this to be a solar project. So I covered it and left it outside all day. Yarn steaming in the sun. You'll know it's done when your baking dish is hot and the liquid in the yarn is clear- that means that the yarn has absorbed all of the dye. Bring yarn inside and let it cool down to room temperature. I then gently washed the yarn in warm water with some Eucalan (again there should be no dye washing off- your yarn bath should be clear. If it is running color, stop washing immediately and put back outside to cook some more. Or wrap it in saran wrap and nuke it in the microwave for a few minutes.) Gently squeeze the water out and then allowed it to air dry. I'd say this was a total success! Update! See more Kool Aid Popsicle yarn that I dyed with notes and tips on this post. Awesome! I'm going to try this! Oh wow! That is beautiful I am super jealous. This looks like a fun project. On and that hibiscus sounds fabulous. Love what you named the yarn. This looks so delicious! :) Great idea! Just decided to try this, and I think you might have had more water in your ice cubes than I did, because the color just sat in little spots, didn't spread at all, and there isn't any liquid to be clear. I'm gonna try again with the same colors but make bigger (and more diluted) cubes, and make sure there's water so the dye has a way to spread. But. Love the idea! And it smells so good! Sublimecreatin- That is interesting! Was your yarn wet to begin with? I also wonder if it's a temperature thing. I'm in Oregon, so when I did this- when it was HOT it was in the 80s. Hot for Oregon but not really the summer temperatures people are getting elsewhere. Did you put the plastic wrap on right away or after they melted like I did? Maybe if the wrap is on in the beginning, it could help with evaporation. Just some thoughts. What a clever idea! I've never tried ice cubes before. And the result is gorgeous. This is so cool! I wonder how well it would work with superwash wool. My kids would think this is fun! Beth- superwash wool won't affect the dyeing process at all. Go for it! Thanks Dee! 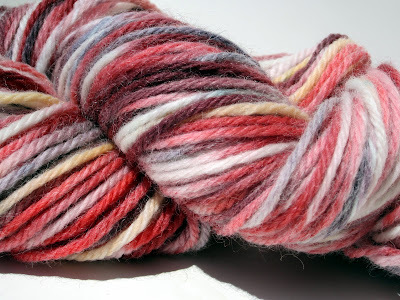 I did a giveaway for this yarn, so a lucky reader now has it. Give dyeing a try! WOW! I really like this idea but I am allergic to wool :( and I really love the was wool holds color and its water resistance. My question is this; will this work with cotton yarn? I hope so. Raggz2baggz- This type of dyeing only works on wool. To dye cotton, you can't use acid dyes (like Kool Aid or food coloring.) You have to use a completely different type of dye- like RIT. I'm not sure but I don't think solar dyeing would work with cotton yarn either. I know from dyeing cotton clothing, that you need the dye bath to be extremely hot. I'm sorry you're allergic to wool. :( Maybe you can try this out while wearing gloves and then gift the yarn to a knitter you love? this is a fabulous idea!! Just a quick question: is using Eucalan for that final rinse vital? Or can I just use water or a bit of laundry detergent? Thanks so much for this DIY! Can't wait to try it. @Meg- No, the Eucalan isn't important. I use it to help rid of the vinegar smell and give it a lovely scent. I don't suggest using regular detergent as it can be too harsh on wool/knitting. I say either skip it or use some gentle shampoo. That is just absolutely brilliant! This looks like a fantastic project. Any tips on using the oven? It's winter here in Canada! Thanks Allegra Young! To use the oven, keep your temperature low. No hotter than 200F. Just keep checking on it- first for the ice cubes to melt and then for the yarn to absorb it all- you don't want any colored liquid coming off. Any excess moisture should be clear. I would say that it wouldn't take longer than 30-90 minutes using the oven method. My kids want to try this! Guess I know what we will be doing this weekend. Thanks for sharing! I have got to try this. I wonder how other fibers will react. It will only work with wool or mostly wool fiber. The Kool Aid or food coloring will not adhere to cotton or synthetic fibers. actually Acid dyes (like kool aid) work well with all protein fibers, including silk, wool, Llama,Alpaca, Bison, camel, horse, dog... but Maia is correct that synthetics and plant based fibers, (including cotton, bamboo, rayon and anything with poly or lycra) will not take acid dyes well. Koolaid has been used to dye human hair (a trick kids into Punk had used when I was growing up- ages ago), so it makes sense that it would work on anything that was once "hair" of an animal, as doula_char said. Also, Mark Lipinski sent me over. 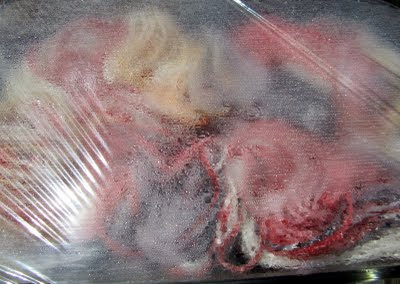 I wonder if I would be allergic to wool too, but I could wear gloves while couching these fibers down on a wall quilt. I bet if you mixed the grape,reds and yellows in each a different shade for every ice cube that the results could yield some pretty flowers once stitched down. what was the ratio vinegar to water for the pre soaking? I didn't measure. You only need a tablespoon or so. I just pour some into the large bowl as I'm filling it with water. Incredible! Thanks for sharing this process. I will try this. 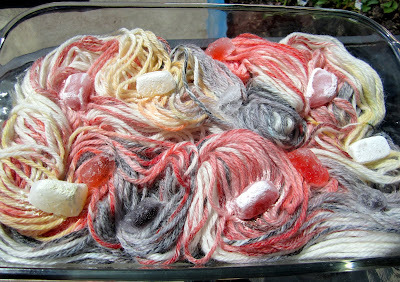 Just recently I have tried out dyeing handspun with Koolaid. It is great fun! I'll be calling KnitPicks fr some blank wool or a wool/silk blend. My aunt in Oregon used t do this type thing when she had her 70 or so head of sheep....lovely. Just Lovely! Thanks for the idea! Have my yarn in the oven now! Thanks for the idea! How much water to one packet of kool aid? Each ice cube section is one ounce. So I did 3 ounces to make 3 cubes. You can play around with it. Just have fun! Thar is just soo "kool"! Thaks for shareing! I think I will try this with a piece of fabric instead of yarn. If the fabric is cotton, it won't work. The Kool Aid will wash right out. Have you ever done this with acrylic or cotton yarns? I am allergic to wool, but I think this is awesome! It will not work with cotton or acrylic. Not at all. The Kool Aid won't dye it. You need wool or a protein fiber like silk or hair. This is so awesome! Is the yarn still in skeins when it's in the dying container? Thanks! Yes, it's still in the skein it came in. 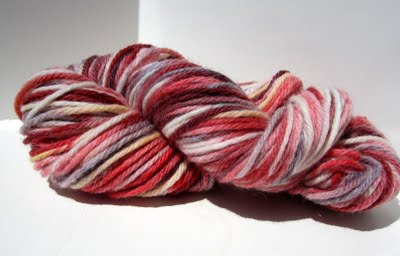 I had no idea you could dye your own yarn! I love this! I am stopping over via a pin on Pinterest! What beautiful colors! I love dying wool with KoolAid! It's non-toxic & when I microwave it, it makes my house smell fruity! What a cool way to Kool Aid dye! Thanks for sharing. Muy buena idea!!! Lo voy a intentar. Gracias! So neat! I've only tried Koolaid/food colour dyes on silk scarves to make play silks. I bet this would be great on some tightly packed silk too! Question from Sweden. Am I right when I think that KA only works with animalistic fibers (not cotton or acrylic)? And why do you and winegear to the yarn before coloring it? And how much water and winegear do you use for, lets say, 4 ounces? If you could reply to malin@byklargren.se I'd be truly greatful! I did it! Mine happened rather quickly because I mistimed the amount of time it would take for the cubes to freeze. Therefore, my prep time for my yarn ended up being closer to two hours! I soaked in water and vinegar, and the yarn took to the cubes IMMEDIATELY. I did one with natural wool (using sherbet colors like lemonade, pink lemonade, blueberry and some creative mixes) and another with a grey yarn base, (using black cherry, grape, grape/blueberry mix). For a first try, I call this a success. Thanks for the tips! Can you do this with a T Shirt? Only if it's made out wool, silk or any other animal fiber. Kool Aid and food coloring will not dye cotton. It'll stain (and look like a stain) but you will not get the look of a dyed shirt. Better to use RIT or another type of fiber reactive procion dye. Genial!!! Me gusta tu blog, te sigo. WOW!!! Great article!!! Its therefore nice and additionally offer sensible information . I actually love it and due to write this excellent blog. Thanks with regards for this Informative blog. What a great idea, it is timely and timeless. Universal applications. Thank you for sharing your creative sense. love this!! Just dyed my wool in the oven this morning. I'm going to try it in the sun next time. When it is really hot in The Netherlands. Thank you!